I’m participating in a mama’s Bible study. 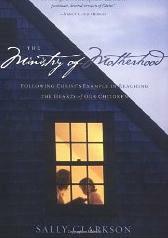 We are going through the book, The Ministry of Motherhood by Sally Clarkson. Each week focuses on a gift mothers can give to their children. This week’s gift is grace (my favorite!). I thought I’d share some notes from each week’s class. We looked at the story in John 21 when (after cooking breakfast for his disciples–I love this! ), Jesus reaffirms his relationship with Peter and his belief in Peter’s ministry. He doesn’t lecture, punish, shame Peter for denying him. He doesn’t even bring it up. As a mama, I have failed spectacularly and this story gives me hope. It is also a great lesson on how I can interact with my kids when they fail spectacularly. Then we looked at John 13, when Jesus washed his disciples’ feet. This story gives a picture of grace through servanthood. We talked about how Jesus motivated obedience by putting the disciples’ welfare above his own. Sometimes by giving them power. We talked about children’s needs for power. We talked about the grace of encouraging words. And looked at my favorite verse: Zeph 3:17. How can I quiet my children with love and rejoice over them with singing? Our final area of grace is forgiveness. Are our homes safe enough places for confession? Or will our kids hide their behavior because they fear the punishments? And when kids mess up, we don’t need to burden our kids with guilt for what they’ve done. God doesn’t do that to us. He forgives and forgets. Romans 2:4. What leads us to repentance? Kindness. How can consequences and discipline be tempered with kindness? We ended the week’s study with a discipline tool: the Comfort Corner. A comfort corner teaches children an important life skill: to learn to step away and regroup when they are in crazyland. Just as adults need a coffee break, children do, too. The most important factor in using this tool is to remember the CC is a safe zone. There is no talk of the behavior or discipline in the CC. The CC is for having a snack, snuggling, reading a book, playing, cooling down. The issue or behavior can be addressed later when you and the child have calmed. There is also no forcing a child to go to the CC. You can suggest it or even place them there but they can leave when they choose. I suggest adults have CCs as well! We introduced a comfort corner to Norah at around 14 months. Norah’s CC was first a corner of the family room with floor pillows, then it was an indoor tent. Now it is her bed. Next week’s gift is inspiration. Posted in Parenting and tagged comfort corner, grace, grace-based discipline, ministry of motherhood, sally clarkson. Bookmark the permalink. That’s her name! Charis! We weren’t going to tell anyone until she was born, but it was too funny that you posted it today that I had to share it with you. I’ve always wanted to be a poised and graceful girl, but I will never be. I thought I might give her a head start, since I’m positive I won’t be helping out with this trait in the genetics department. I really like this comfort corner idea. It could also be really fun to help them hunt for one around the house. I love it, Jenn! Scott and I used to know a brilliant teenager named Charis. She was so lovely. It is rare you find a name that only has fond associations! Fantastic choice for your sweet girlie.